One way around this is to travel during the off-season. March and April are great months to visit Europe and so are October and November. The prices are cheaper, the crowds less pronounced and the natives are less likely to run away at the sight of yet another camera totting tourist. 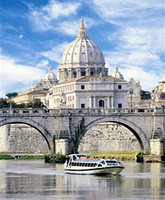 Celebrity Cruises has a wonderful 10-day cruise to Europe that proves my point about traveling in the quiet months. If you sign up for the cruise departing Rome on August 3, 2007 you’ll have to pay $1,669 for the cheapest cabin. If you sign up for a similar cruise departing in November you will save close to $700. The choice is ultimately yours of course. Pay less and see more or pay more and see less.